Around 11 a.m., the San Luis Obispo County Sheriff’s Office received reports of shots fired at a home in the 100 block of South Mallagh Street in Nipomo. Investigators responded to the scene and determined a BB gun was used to fire the shots. No one suffered injuries due to the BB gun fire. The high school lockdown was lifted after investigators identified the firearm as a BB gun. Shortly afterwards, deputies stopped a car matching the description of a vehicle involved in the shooting. Deputies arrested all five people who were inside the vehicle. Two of the suspects were 15 years old, one was 18 years old and two were 21 years old. All the suspects were males. The sheriff’s office says it is still investigating the BB gun shooting and trying to determine a motive. Two of the suspects were 15 years old. Maybe they should have been in school. Meanwhile, congress can’t hold back federal dollars to cities, like S.F. that harbor illegal aliens that shoot innocent people like Kate Steinlen. What in the hell is this world coming to !?! 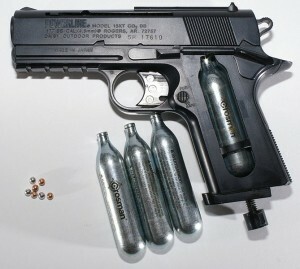 First, a BB/pellet gun cannot be “fired” as they are not firearms. Second, five morons driving around and plinking at a house with their BB pistol resulted in a high school being “locked down” even though it was five blocks away. Really? Was there a helicopter, sheriff’s deputies and Cal Fire also involved this time? I’m pretty sure the sheriff brought the panga boat also; it was being navigated by Adam Hill. Come on people. Read the article. Shots were fired at a home. That is a crime regardless if it is a BB or a ballistic weapon. Furthermore 5 males shooting at a home on Mallagh is most probably gang related. This was an initiation in my opinion. Good job SO and GTF. “An initiation?” Do you mean to imply that this was a GANG initiation? Into what gang? The pee-wee BB slingers of the 805? Read the article again. “Reports of shots fired at a home in the 100 block of South Mallagh Street in Nipomo” could mean that the shots were fired ‘on the property’ OR “at” the home. So, which is it? Even if they shot at the home structure, it doesn’t pass the ‘kids will be kids’ test. So what? FIVE ARRESTS? In my day, that was FIVE phone calls to parents. I shoot my BB gun all the time in my backyard. Never had a problem with it. Its not even loud!! A microwave makes more noise than a BB gun. Something fishy about this story. I bet the 911 caller has other issues with these kids and was looking to screw them over. They must be using a BB gun sound enhancer to make it sound like Hollywood gunshots. It’s sort of like the clicking sound your phone makes, but a lot louder. Just wait, the next paranoid caller will be because of a cap gun being used by kids playing Cowboys and Indians. Wait, what? Five people arrested because they shot a bb gun?